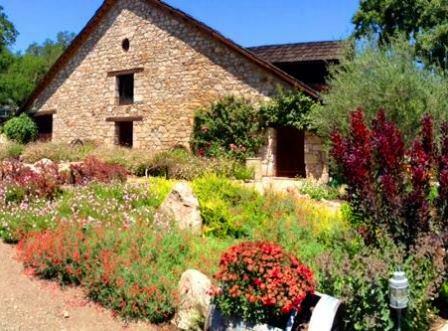 Seavey Vineyard has a long history in the Napa Valley. It was first cultivated all the way back in 1881 by the Franco-Swiss Farming Company, headed by Charles Volper. At the time, the large 143 acre estate was used for both vineyards, as well as a cattle and horse ranch. By 1894, ranching won out, and the vines were allowed to die. Eventually, the property was turned into a cattle ranch. That changed in 1979 when the San Francisco couple, William Seavey and Mary Seavey purchased the property and renamed the estate. The entire vineyard needed planting as it had long since gone fallow, used primarily for cattle grazing. They began cultivating their vines in 1981. For the first few years, Seavey sold their grapes to other producers before producing a wine under the Seavey name. The winery made its debut vintage in 1990. Originally, Seavey hired Gary Galleron as their consultant. In 1995, they changed things up and brought in Philippe Mekla as their consultant, becoming one of his first clients. Seavey owns 43 acres of vines. Located in Conn Valley, much of their terroir is in a warm-micro climate, the soils are volcanic rocks, stones and sand. Located close to the Meadowood Resort, the vineyard is focused mostly on Bordeaux varietals. 34.6 acres of Cabernet Sauvignon, 3 acres of Petit Verdot, 3 acres of Petit Verdot and 2.5 acres of Chardonnay are currently planted. At Seavey, they try dry farming as much as possible. In fact, a specific, 4.6 acre parcel of Cabernet Sauvignon planted on their steeper, hillside, terraces is exclusively dry farmed. Initially, in 1990, Seavey released Cabernet Sauvignon and Chardonnay. In 1994, they added a Merlot to their lineup of wines. Today, Seavey produces Cabernet Sauvignon, Merlot, Carivana Cabernet Sauvignon and Chardonnay. In addition, Seavey recently added a high-end, limited cuvee’, Founders Reserve. The Founders’ Reserve is a small, 50 case, 100% Cabernet Sauvignon production that is made from the estates oldest vines. The vines are in their oldest, terraced part of the vineyard, that is exclusive dry farmed. The Cabernet Sauvignon, which is the wine to buy, has an average production of under 1,000 cases per year. Caravina Cabernet Sauvignon, which is made from the estates youngest vines, and is made in a forward style has an average production of more than 2,000 cases per year. On average, Seavey ages their red wines in 50% new, French oak barrels for between 18-20 months before bottling. Based on how well their early vintages like 1991 and 1994 are aging, this is a fabulous wine to lay down in your cellar, as the wines do evolve, taking on additional complexities. Seavey is best served at 15.5 degrees Celsius, 60 degrees Fahrenheit. The cool, almost cellar temperature gives the wine more freshness and lift. Young vintages can be decanted for 1-3 hours, depending on the character of the vintage. This allows the wine to soften and open its perfume. Older vintages might need very little decanting, just enough to remove the sediment. Seavey is best served with all types of classic meat dishes, veal, pork, beef, lamb, duck, game, roast chicken, ribs, hamburgers, barbecue, roasted, braised, grilled dishes and stews. Seavey is also good with Asian dishes, hearty fish courses like tuna, salmon, mushrooms and pasta. The white wine of Seavey is best served with all types of seafood and shellfish, sushi, sashimi, chicken, veal, pork and cheese. Powerful, big, fat, dense, tannic, full bodied and concentrated. The wine has character, complexity and length, balancing ripeness with fresh attributes. Based on previous vintages, this needs time in the cellar, but it has proved time and time again that it has the ability to age, and evolve. A little oaky, and primary at the present, I expect this will be even better with a decade of sleep under its belt. The wine was made from a blend of 94.5% Cabernet Sauvignon and 5.5% Petit Verdot. Now we're talking! The flashy, licorice, fresh roasted espresso bean, earth, cassis, chocolate and black cherry nose gets you going. On the palate, the wine is fleshy, rich, round and full bodied. The wine will definitely improve with 3-5 or more years of bottle age. I'm still drinking my 1991 Seavey with pleasure, so this could turn out to be very long lived. Coffee bean, blackberry and cocoa notes lead to a round, ripe, rich, black cherry, licorice and earthy finish. Forward in style, this is already fun to drink. Charcoal, chocolate covered cherry and smoke open to a soft, open, forward, Merlot that will be fun to drink young. From 90% Cabernet Sauvignon and 10% Petit Verdot, this richly textured, deep colore wine opens with blackberry, earth, smoke and spice, before the wine ends with a round, chocolate covered, fresh blackberry finish. This should improve with age. With licorice, cherry and oak, this medium bodied, lighter style of Merlot is probably best enjoyed on the young side of life. Pure cassis, with fresh, crisp, cherry laden fruit and a sweet, concentrated, long, blackberry and cocoa, soft, smooth finish. I really like the style of this wine. Blending an interesting mix of 90.5% Cabernet Sauvignon and the remainder taken up with Petit Verdot, the wine is filled with ripe dark berries with hints of chocolate covered cherry, forest floor, earth and a hint of smoke. The rich, concentrated, refined wine has everything in balance, ending with a big juicy mouthful of ripe, chewy, spicy Cabernet Sauvignon. I like how this is showing today. Based on recent tastings of the 1991, the wine has a good future. This could be one of the longest lived wines of the vintage. The original $40 cost continues paying dividends! Stylish, ripe, fresh and loaded with cassis, blackberry, earth and cherry notes. Full bodied, spicy and ready for its prime time, Seavey once again offers some of the best value for the money in high quality Cabernet ased wines in California. Packed with tobacco, blackberry liqueur, smoke, earth, black cherry jam. This is full bodied, deep and long. This wine is still young, fresh and packed with fruit. Filled with ripe blackberry and licorice, this beefy, meaty, concentrated, full bodied intense wine was still young and fresh. This will only get better with time.